Myanmar, or Burma, as many people still call this pie slice-shaped country by the Indian Ocean (the CIA Fact Book explains the name change by the military junta in 1989,) has been in the global public eye of late. We’ve read the headlines, we’ve seen the images: a saffron sea of monks flooding the streets of Yangon (or Rangoon), said monks running for safety as uniformed soldiers turned their bullets and batons on the unarmed crowds, and the tired lines that have creased detained opposition leader Aung San Suu Kyi’s delicate face. As significant as these latest events are, mine is not a political blog so I won’t elaborate on the political turmoil ravaging this small Southeast Asian country. However, I do believe Burma deserves to be in the headlines but for a very different reason. I’d like to draw your attention to a less controversial subject–food. Burma’s distinct cuisine is hitherto unknown to many of us in the Western hemisphere; that’s very unfortunate and needs to change. With a population of almost 47.5 million spread across 657,740 sq km of land, Burma has many neighbors, being wedged in between Bangladesh, India, China, Thailand and Laos. So it’s not surprising their cuisine bears influences from these countries, as I discovered during my first Burmese meal at San Francisco restaurant Burma Super Star. Among my favorites: the knockout tea leaf salad (Lephet Thoke), served deconstructed on a giant plate then tossed with flourish at our table, comprised “fermented” tea leaves (the server would not elaborate on the origins beyond “we import it from Burma”), garlic bits fried to a crisp, roasted peanuts, tomatoes, shredded cabbage, dried shrimp and split yellow peas; a combination of tang and salt blossomed on my tongue, courtesy of lime juice and fish sauce as I chewed and crunched through every tasty bite. And their biryani arrived aromatic and vermillion-tinged, a milder riff on the classic Indian dish with its more cinnamon and clove-y notes in stark contrast to the usual up-your-nasal passage effect of chilies and cumin. As you can imagine, my senses were all agog. Born in Rangoon in 1936, Alvina is half Burmese and half English (Burma was a British colony until independence in 1948). Like many middle-class families in Asia, she had servants and cooks who took care of all the household chores. Alvina was a kitchen neophyte until she and her husband moved to the U.S. with their four children in tow in 1972. “I learnt how to cook in the U.S. because I was missing my food,” she said. “I was asking other people from Burma (in the Bay Area) for cooking tips.” With an excellent critic by her side–i.e. her husband–she was able to recreate her favorite dishes for her five children (and growing contingent of grandchildren which presently numbers 5.5–one is on the way), and even impressed her relatives visiting from Burma! Alvina explained it very simply, “The more you cook the better you become.” Wise words of advice for any aspiring cook. In any case, considering how basic and supermarket-available the ingredients are, as demonstrated in the Burmese curry recipe Alvina gave me below, it’s easy to keep experimenting until you get it just right. I have to admit, Alvina gave me this recipe over the phone so I wasn’t sure if it would work without tweaking. But when I cooked it in my kitchen, *boom*, the flavors all came together. You can substitute the pork with any meat of your choice–beef, chicken or shrimp–and for a one-wok meal, throw bite-sized vegetable pieces such as pumpkin, cauliflower or potatoes into the pan together with the meat. The curry itself is not too spicy as the Burmese tend to have side dishes and dips made from chilies and shrimp paste to turn up the heat. The paprika is added more for color than heat, so if desired, substitute up to 1 teaspoon of the paprika with chili powder. 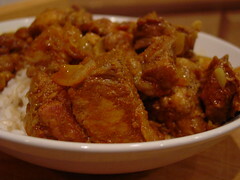 In a medium bowl, marinate pork with next 5 ingredients. Mix well (your hands are the best tools for this but beware, your nails will be stained ochre by the turmeric so use gloves!) and set aside. In a large skillet, sauté onions over medium heat in oil until translucent and a little brown at the edges, about 3 to 4 minutes. Add paprika and mix until onions are coated evenly. 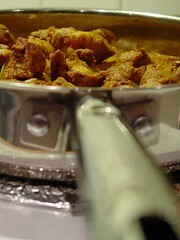 Add pork to skillet, turn heat to medium-high and mix well. Cover and cook over medium-low heat for about 45 minutes to an hour until meat is tender. Adjust the heat if necessary, you don’t want the meat to burn. Check seasoning and add salt if necessary. Garnish with cilantro leaves and serve with steamed jasmine rice.